Cooley Equestrian Centre provides expertise to make your horse riding experience more than just a memory. From hillside hacking to obstacle training, pony days to games and dress up fun. There is something for everyone and every age group and experience level. 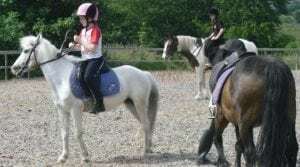 Whether a serious rider or beginner all your needs will be catered for at Cooley Equestrian Centre. Cooley Equestrian Centre manages it’s day to day activities in an environmentally sensitive manner, we are located in an area of natural beauty and try to be as sympathetic with the natural environment as possible. We encourage customers to respect the environmental and try to educate them about biodiversity and their surroundings wherever possible.